Now that Skorca is down to the borders, I had to think about what needed to be done next. 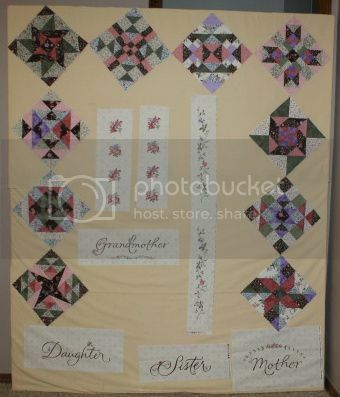 And since this needs to go to the quilter by early April, it had to be next on the wall. 10 of the 12 blocks from my 2011 Saturday Sampler, plus the panel I cut apart. No idea how it's all going to come together yet. The panel isn't in the original design, plus there's some elements in the design that I don't like. I do like the center medallion, so my goal for the week is to get that together, and the two remaining blocks.